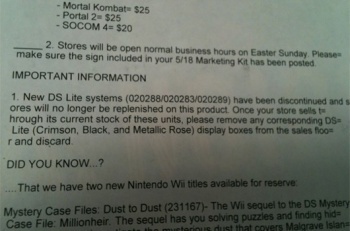 GameStop will no longer be selling the venerable DS Lite once it runs through all units in stock. Nintendo's DS is arguably the most successful videogame platform of all time, but it wasn't until the first revision - the DS Lite - that it really hit its stride. The Lite removed the bulk from the original DS, gave it a brighter, more vibrant screen, and was in general provided a significantly more pleasant experience than its full-sized big brother. In fact, even after the advent of the DSi and DSi XL (my personal DS of choice), many still swore by their trusty old DS Lite. Well, gamers looking to pick up a DS Lite may not have the option for much longer. An internal GameStop memo obtained by GoNintendo (seen here to the right) confirms that the retail giant will be removing all references to the DS Lite from its stores once it sells through its current supply of the handheld. This information was confirmed by Engadget. While kind of sad, it's not surprising that the DS Lite has reached the end of its retail lifespan. In fact, what is surprising is that it took this long. The DS Lite has seen no less than three successors in the DS family hit shelves - the DSi, DSi XL, and most recently the 3DS - and it's a wonder GameStop didn't pull the plug sooner. It just reflects the handheld's popularity, I suppose.